A Review of Randy Alcorn’s, “If God is Good: Faith in the Midst of Suffering and Evil” This Should be Required Reading for all Apologetics Classes. Randy Alcorn’s treatment of the doctrine of theodicy is the, “go to” book on the topic. It is suitable for the neophyte and mature Christian both. 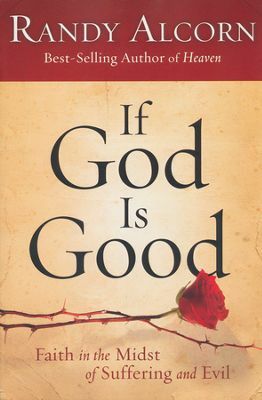 If you have ever asked yourself the question, “If God is Good why does He allow bad things to happen to good people?” Or if anyone has ever asked you that question, this book will aid you greatly in giving an answer. I was briefly exposed to this area of Christian theology shortly before providentially finding out about this book. I was blessed by it and I believe you will be to. Randy writes this book with a Pastor’s heart. He understands that people reading this book are going to be from a wide and varied background with all kinds of questions and hurts. If you have lost a child, been struck with a terminal illness, seen horrific violence, or ever wondered how an omnipotent, benevolent being could allow these things, you can read the explanation that has been carefully crafted and laid out so as to heal and not hurt. I’ve never read such a thorough and gentile explanation that was also so blatantly honest. I’ve read very dry white papers that are accurate, but lack the heart of a Pastor. These works often enrage critics or those who doubt. I’ve also read other books that fail to answer the hard questions about God in light of suffering. The, “cotton candy theology” of men who only want to sell you a book or preach some false life enhancement Christianity only leaves us vulnerable when tribulations occur. Randy includes real situations, with real people who have been through terrible things. He methodically and caringly explains theodicy so that it will be a comfort and easy to understand as well as explain. If you are an apologist, get this book and study it. They next time you run up against a flaming atheist making the accusation of, “I’d never believe in a god that would allow a baby to be murdered!” You’ll be able to give an answer. If you have a loved one who is going through difficult times, perhaps they have read books from those smiling self-help, guru, false preachers and have not been helped, but instead left doubting, GIVE THEM THIS BOOK! I can’t say enough good things about this book and how useful it is. I give it 5 starts, two thumbs up, and an emphatic Amen. You can pick up a copy from Christianbook.com or Amazon.com. The Holman NKJV Study Bible in Black Genuine Leather, Revisited.